The only thing better than discovering a new place and learning new things is experiencing it all with others. Group trips see the creation of memories treasured by everybody involved for a lifetime – from school trips and weekends away with friends to getaways with family. This week Hostelling International Groups are inviting you to share your favourite memory from group trips gone by to be in with a chance of winning a £250 cash prize! 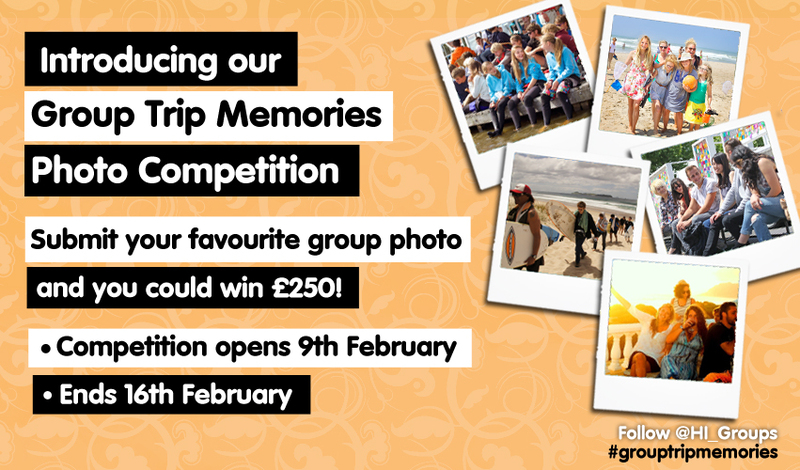 Introducing our brand new #GroupTripMemories photography competition. We all have photo albums and treasured snaps that with one look remind us of the wonderful times we’ve had on group trips, the heart-warming memories we created on them and the new experiences we undertook together– but can you pick your favourite? Whether it be an action packed shot from an activity you braved on a trip together, a group photo with a beautifully scenic backdrop, a snap from a stay at one of our HI hostels, a shot of you with your students on a past educational trip or even just a silly-faced group ‘selfie’ – you could be in with a chance of winning. Remember to use the #GroupTripMemories hashtag on Twitter alongside your photograph! All group shots entered must contain a minimum of 5 people! The competition kicks off today at 12:00 GMT and ends on Monday 16th February 12:00 GMT. HI Groups will be looking through every entry and the chosen winner will be announced on our social media pages at 12:00GMT on Tuesday 17th February. Don’t miss your chance – cast your mind back to group trips past and you could be our 2015 photograph competition winner. Ready, steady – click here to enter!